The Leach Pottery - Marty Gross Film Productions Inc. This is the only complete film available on the world-renowned artist potter Bernard Leach, one of the most influential craftsmen of the 20th century. The resulting documentary film is a charming presentation of the daily activities at The Leach Pottery. 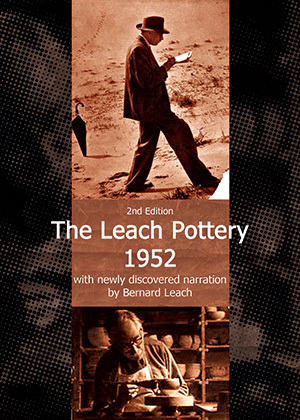 This locally-made film, now restored and released for the first time on DVD with the cooperation of the late Janet Darnell Leach, and narrated commentary by Warren Mackenzie, provides an especially intimate look at The Leach Pottery. MacKenzie's excellent voice-over commentary helps explain the workings - artistic, personal, economic - of the pottery. "...an engaging guide to one of the most important sites in modern ceramics." point of view on what St. Ives and the Leach philosophy meant...takes the abstract idea of Leach's legacy, and makes it specific and personal..."
".... a delightful package of rare and historic material. I can't recommend it enough." UPDATE: Several months after the initial DVD release of this film, a 1/4 audio tape reel was discovered in a box of films donated by the widow of film distributor John Anderson containing Bernard Leach's previously lost narrative for this film. This new edition includes this historic audio commentary. A Japanese subtitled version is now also available*. Bernard Leach founded The Leach Pottery in St. Ives, Cornwall, England in 1920, where he later wrote his classic; A POTTER'S BOOK. The Leach Pottery soon began welcoming visitors from around the world to view it's unique experiment in reviving hand-crafted pottery, then regarded as doomed to extinction. In 1952, as The Leach Pottery was acheiving international renown, members of the local photography club set out to show the process of creating pottery by producing this originally silent film. Newly discovered audio commentary by Bernard Leach; recorded by John Anderson, founder of Films on Craft Ceramics. 14 page booklet, including newly translated article by Shoji Hamada, early newspaper article by Bernard Leach and more. Order together with "Potters at Work" DVD and save! Useful links for those interested in the pottery craft. email videos@martygrossfilms.com for more information about purchasing or licensing this film for broadcast.